Does B Clear Patches Really Work? Acne is a minor problem for some, and a serious problem for other unfortunate individuals. If you have a serious problem, you should seek professional help, but for those that have the occasional pimple here and there, the B Clear Patches might be the perfect remedy if you want a quick fix. It is very easy to use and truly is a quick and clean way to take care of the occasional pimple, or small acne break out. The B Clear Patches utilizes a sliver thin type of skin that is made up of Hydrocolloid material that serves to isolate the area that is affected, shielding it from outside bacteria and providing a moist environment that helps to support the body’s natural healing process without the affected area drying out. The B Clear Patches is supposed to be water resistant, very easy to put on, and because you can apply makeup over top easily, the patch can be worn very discreetly. 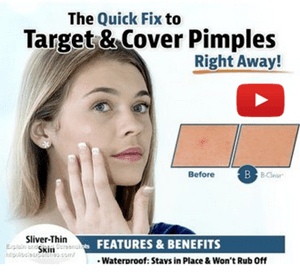 The claim of the B Clear Patches is that it advertises itself as being the best, the most effective, new way to get rid of acne and pimples without having to pop them or squeeze them to get the infection out. As stated, it is extremely water resistant, meaning you can shower, swim, or be exposed to water in any type of a way, without having to worry about the patch coming off. It is discreet, is easily hidden from other people, and is supposed to be comfortable enough that you’ll even forget you’re wearing it. Obviously the main hype about the B Clear Patches is that it is able to get rid of your acne problems quickly and easily without any type of mess that is sometimes associated with the creams, liquids or gels that are sometimes associated with acne treatments. The B Clear Patches is transparent and is almost invisible when wearing it. You can use make-up over top to conceal even more, and because of its healing properties, it will not only cover up the problem, but make it go away really quickly. The cost of the B Clear Patches is $19.95 for 18 peel-off stickers and shipping is free. In fact right now you can get an extra 18 peel-off stickers for free, and there is no additional cost for shipping on these either. The commitment with the B Clear Patches is that it will effectively treat small outbreaks of pimples or acne with their very thin peel-off stickers. The stickers not only hide the fact that you have a pimple, but they also disinfect, protect, absorb, and as stated, cover up the affected area. This means once you remove the B Clear Patches sticker from the affected area, most times your problem pimple will be gone. They are gender- neutral, meaning both men and women can easily use this treatment without it looking unnatural. From the reviews I’ve seen on-line and from what people seem to be saying about the B Clear Patches is that it works well for them, and even though it may work a little bit better for women due to the fact that using makeup will give more of a cover-up, even for the guys the B Clear Patches covers up enough that you feel comfortable about going out, and that’s pretty well the most important thing. The final B Clear Patches review is a positive one, and for the money it works out to about 60¢ per sticker. If anybody has ever had a problem pimple, especially if they are looking to go out for the evening, 60¢ is quite affordable to dish out, and the only inconvenience is the fact that you may want even more than what they offer individually. We are going to give the Clear B Patches a Try/Buy. Acne is a big problem for a lot of people. To help with this we have reviewed a lot of different acne products that you may want to check out. What do you think? Does B Clear Patches work or not? Does Zero Nicotine Really Work? Does the Peloton Really Work? Very effective product! After using B clear patches all my acne vanished and my skin looks healthy now. Thanks for the great product.